My new love affair, Meatballs. A few months ago I made Homemade Meatballs for the first time, sad huh? While searching for a basic meatball recipe I found tons of recipes from around the world. Little did I know that meatballs are consumed globally, all different meats and ingredients. I just thought it was too good to be true… but then it got better. I found this Nonstick Meatball Basket that allows you to cook meatballs on the bbq! It has been a dream come true. I want to make meatballs every night – I even made a special trip to the butchers just for ground meat. Super yum! I need to get a meat grinder because I have a feeling this is going to get out of control! Scoop 1 1/2 tablespoon-size balls from the veal mixture. 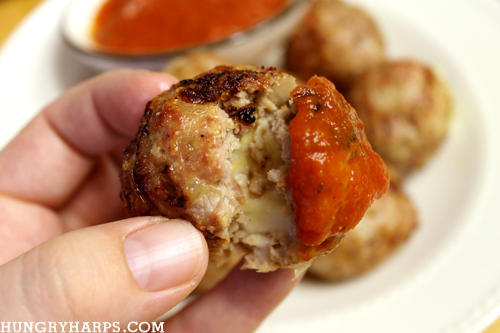 Stuff a cube of Fontina into the center of each meatball and roll to enclose the cheese. 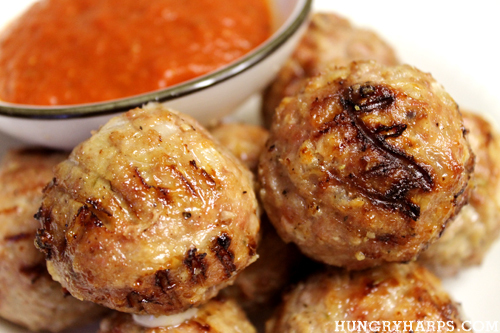 Transfer the meatballs to a plate or baking sheet and refrigerate for 30 minutes. Bake 25-30 minutes or until are golden brown. Some of the cheese may ooze, but don’t worry, there will still be cheese inside. :) I bbq’d my meatballs for about 8 minutes on each side then returned them to the skillet that I cooked the onion mixture in and let heat on WARM until we were ready to eat. These are the best meatballs I have ever made, it may have been the fact they were veal – but nonetheless, they were the best! Recipe adapted from Food & Wine. I'm stopping by from the eRecipeCards page. 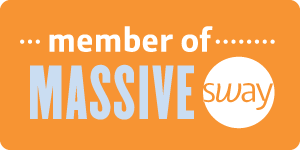 I'm a new follower of yours...You've got a great site, and I'm anxious to look around more. Stop by mine if you get the chance! Glad I stopped in to see this recipe, I have bookmarked both of the meatball recipes. They would make wonderful appetizers. Great recipe post-yum!